What a glorious Monday with brand new vids from some of my fave rockin’ teen combos….. I know what time it is……..
Time flies by so quickly in this music world we inhabit. It hardly seems like yesterday since “Totalitarian Tip Toe” came out but here we are 51 weeks later with a brand new waxing from the ever excellent As Able As Kane, or AAAK as their mothers call them. And things have moved on somewhat on the musical front. Here we have twelve songs in two parts…..essentially new stuff over the first six, and then re-imaginings of the original release, from 25 years back, with the current band members. The line up album for the album is Paul R on vocals, Ding on bass and keys, Tamsin on vocals, Seth Leppard aka Neil R on guitar and Adam Buckeridge on drums. For live purposes Dan Woolfie has subsequently filled the drum shoes with Adam focusing on Bobbie Peru with Ding and Bert – but that’s another story. Now then this is somewhat different from what has gone before – and as I remarked on their performance at the Salford Music Festival last September – after supporting Red Hot Chilli Peppers in Europe – the band has taken a slight change in direction with a little more “rock” in the EBM than hitherto. This is no doubt due to Mr Archer putting more live bass and drums into the mix. The core of the AAAK approach is still there with Paul delivering his rapid fire wordplay, counterbalanced and supported by memorable vocals from Tamsin, but the addition of “real” drums, instead those brewed in a Roland Drum Machine (or equivalent), and Ding delivering his consummate bass performance, coupled with measured guitar from Neil – together with the usual intelligent use of synths and found sounds makes for a development and improvement in the bands work. There is, specifically, I think a funkier feel to the music – evidenced on “Enjoy Your Moment” and the reworking of “Time” – but also the willingness to experiment with the soundscape as it moves from the expected to the unexpected within the scope of one song. 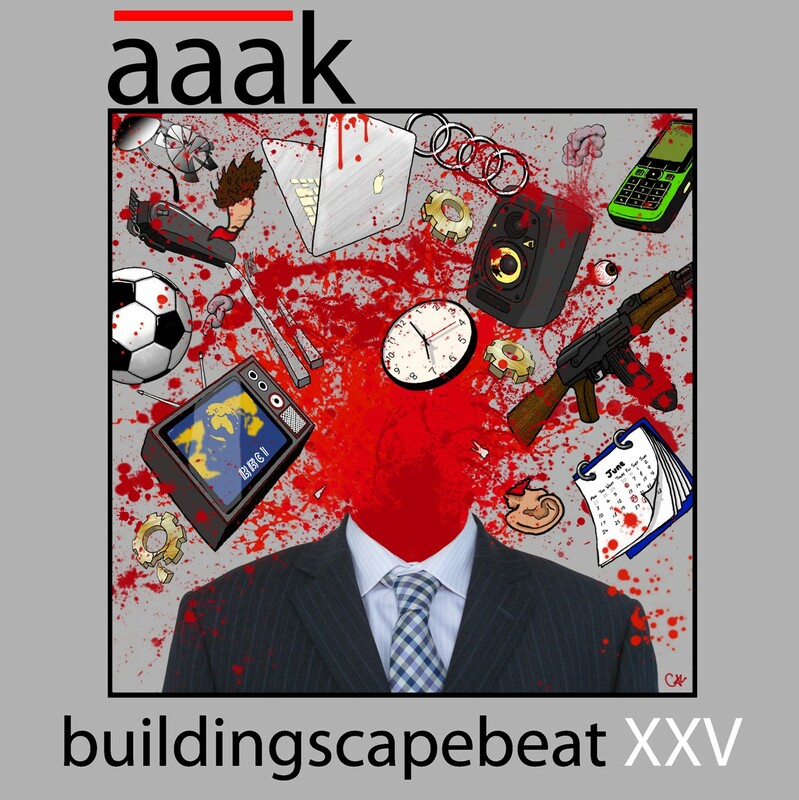 The opening of the eponymous “BuildingscapebeatXXV” which is sparse and compelling leads into a manic piece of dance music built around a seductive bass part and eastern scales from Neil, with sculptured synth squelches from Ding. All too short in my opinion and I trust there will a longer 12″ vinyl mix somewhere in the recording studio? However there is also a punkier/rockier feel to the music demonstrated ably by the scabrous “Memorial Song” which is an angry beast of a thing. Fast, unwilling to take prisoners, and rather marvellous. Always great to see the great metropolis of Salford name-checked in any tune and the heart of the old city gets plenty of attention with the tasty “Ordsall Calling”, and its motorik rhythms coupled with dirty bass line, and hair-raising backing vox from Tamsin, make it the stand-out track on the album for me. Having said that opener “Never Stop Me” comes a close second with Paul’s rising vocal menace and the excellent break downs during the song. Listening to the six re-workings of the older tunes I am reminded of that gig at The Crescent and how much more the bands material is honed and enhanced by the traditional rhythm section approach. A superb “Sharpshooter” has always been a particular favourite, and as mentioned above the excellent “Time” would not be out of place in a Parliament/Funkadelic set list. 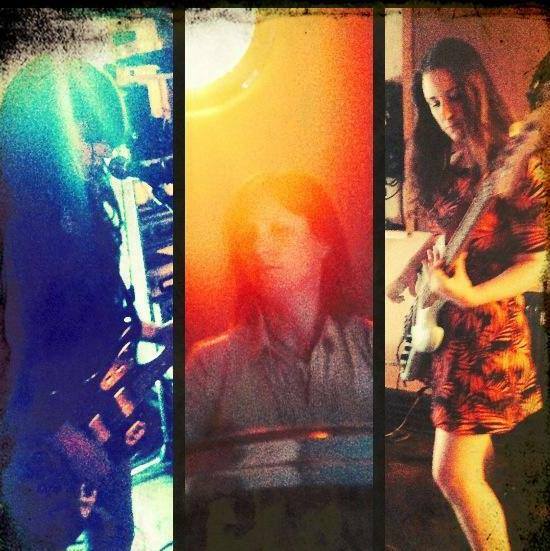 “Cruise Control” is brutal, unforgiving and rather special, coming across like a mutant prog-dance piece. “What Are We Here For” brings back the more traditional dance elements, almost no-wave in it’s approach, with various sounds chittering in and out of the mix around a bubbling bass riff. “Brain Drain” is perhaps the only track of the half dozen where I actually prefer the simplicity of the original version – perhaps a little too mutant disco for my tender ears. To conclude “Outland” appears to be the most radical of the changes to the original material taking on a more epic feel and adding to an already excellent original piece. I very much doubt if there is another band out there doing material like this – it is unique, effectively delivered and memorable. The album will be launched at Ruby Lounge in Manchester on 23rd August. More info on Facebook.